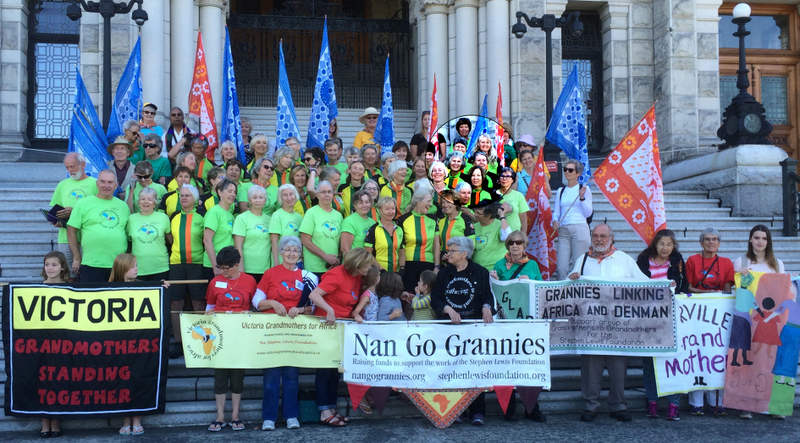 Click inside the NanGo Grannies banner to view a short animation of the bike tour route and the highlighted riders to meet Nango Grannies' riders Jane Templeman, Patricia Hofstrand and Elizabeth Vreede. "We made it! Thank you for your generous support, words of encouragement and donations! To date, the tour of 27 grandmother riders has raised over $67,000, with an additional $13,000 raised by grandmothers in a 50 km cycle on Sunday in Victoria. Our three day ride was both exhilarating and arduous, sometimes at the same time. The weather was great, and the company of the other riders and organizers was delightful. Eight Grandmother groups from Campbell River to Victoria (including a great lunch stop in Nanaimo hosted by the Nan Go Grannies) kept us abundantly fed and welcomed. More than a long bike ride, it was an experience of community and of solidarity with grandmothers here, and always with grandmothers in Africa uppermost in our mind and hearts. It was inspiring to be a part of this challenge and to witness the good spirited determination of older women."